This family favorite hearty chicken stroganoff is made in one pot and ready in 30 minutes, which makes it a perfect busy weeknight meal! Everyone has heard of beef stroganoff, but this chicken version is every bit as hearty and comforting! 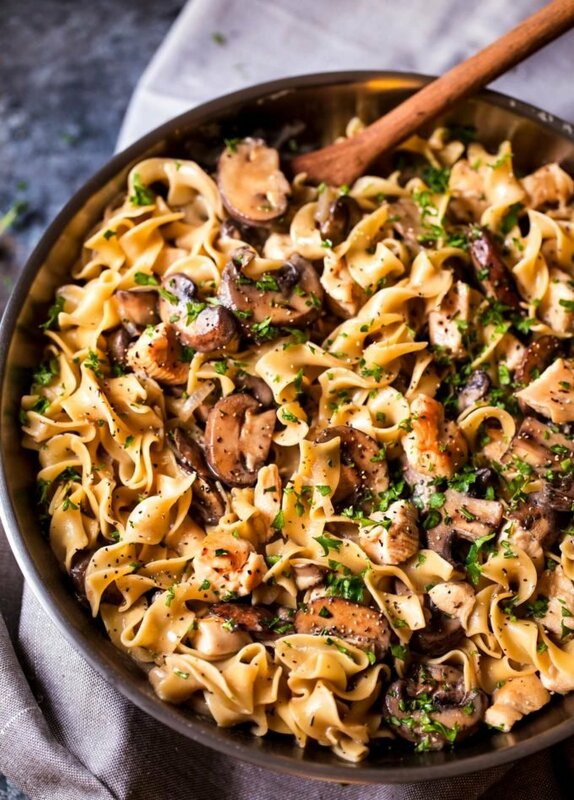 Plus, the egg noodles cook right in the same pot, to make this a one pot, 30 minute meal! You guys. I feel like I hit the mother load with this dish. 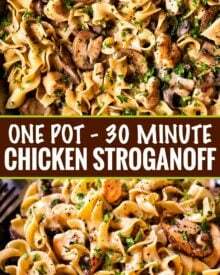 All those classic stroganoff flavors, with lean chicken breast, made in one pan, and ready in just 30 minutes! I love dishes like this… they’re so perfect for a busy weeknight! But you know, this dish is tasty enough, you could easily serve it to extended family for a Sunday dinner as well. Originally a Russian dish, stroganoff is traditionally made with sliced beef cooked with mushrooms in a creamy sauce made with some tang from sour cream. I love the beef version, but we love this chicken variation just as much! 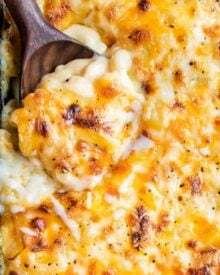 It’s more budget-friendly, still every bit as savory and creamy, plus it’s made in one pot. 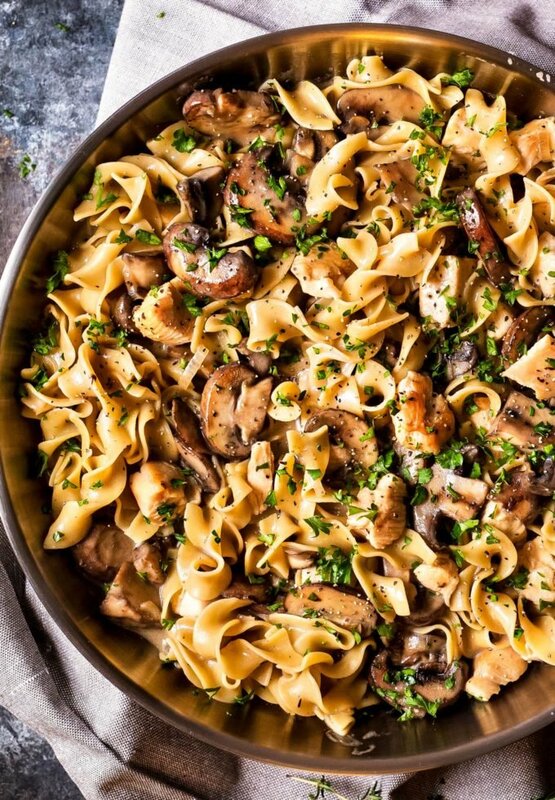 My weeknight-friendly chicken stroganoff is made with a sauce comprised of white wine, rich chicken stock, mushrooms, onions, garlic, layer upon layer of seasonings, tangy sour cream and zingy mustard. Velvety and creamy to say the least! This meal looks and tastes like you slaved over the sauce for hours, yet it only took you minutes to throw together! This meal does use white wine to deglaze the pan, but if you’re really opposed to using alcohol, just use an equivalent amount of chicken stock. I love the little zip of flavor the wine gives, but it’s optional. 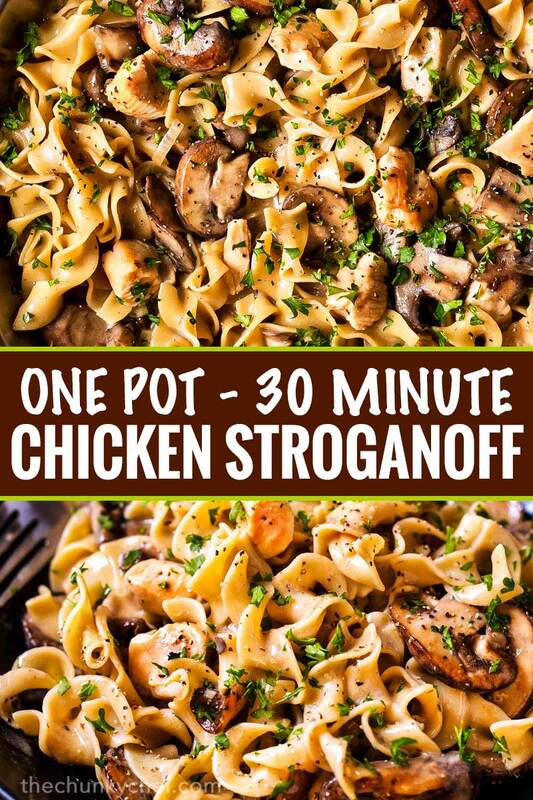 IS CHICKEN STROGANOFF REALLY A ONE POT MEAL? 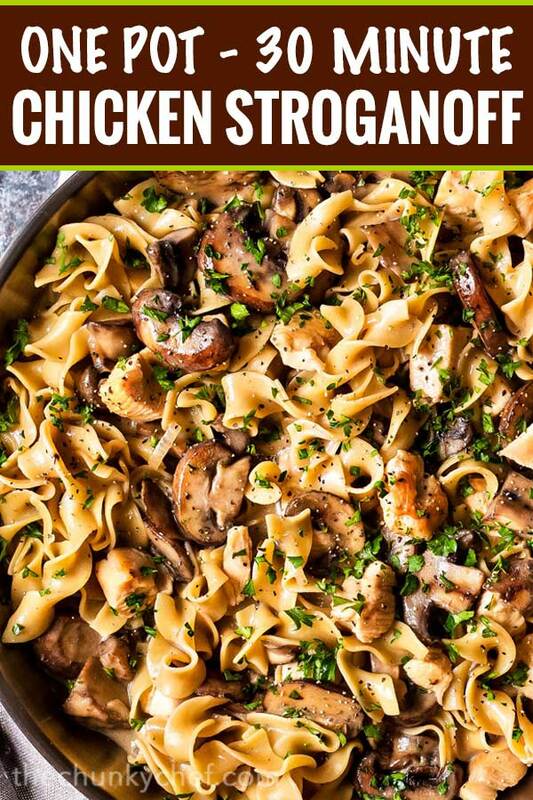 Yes, my favorite part about this chicken stroganoff is that it’s a TRUE one pot meal! A lot of one pot meals call for cooked pasta, which means unless you happen to have cooked pasta hanging out in your refrigerator, you have to use a second pot to boil the pasta, plus use the colander to drain the pasta. That’s two extra dishes to wash. I’m definitely not looking to ADD to my dishwashing load! With this meal, the dried pasta cooks right in the same pan!! Literally the only pan you’ll have to wash is the one you’re cooking in. Now that’s what I call a great one pot meal! CAN CHICKEN STROGANOFF BE FROZEN? I haven’t officially tested this, since we never have any leftovers, but I would tentatively say yes, but with a few warnings. First, if you think you’ll be freezing this meal, DON’T add the dairy to the portion you’ll be freezing. Freezing dairy is hit or miss, and usually ends up separating during the thawing process and is truly unappealing. Just add the dairy to your chicken stroganoff as you reheat it. Secondly, thawing frozen pasta in a sauce can make the pasta a bit more “mushy” in texture. I like to serve this chicken stroganoff with a crisp green salad, but we also really love to have these cheesy Brussels sprouts with bacon alongside. 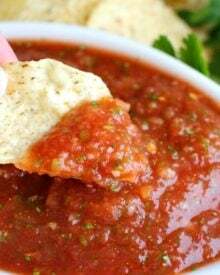 A big piece of crusty bread is also perfect to soak up the luscious sauce! Cut your chicken into bite sized pieces, or slice thinly. Alternately, you can use shredded rotisserie chicken if you have some on hand. Try to use cremini (also called baby bella) mushrooms if you can. 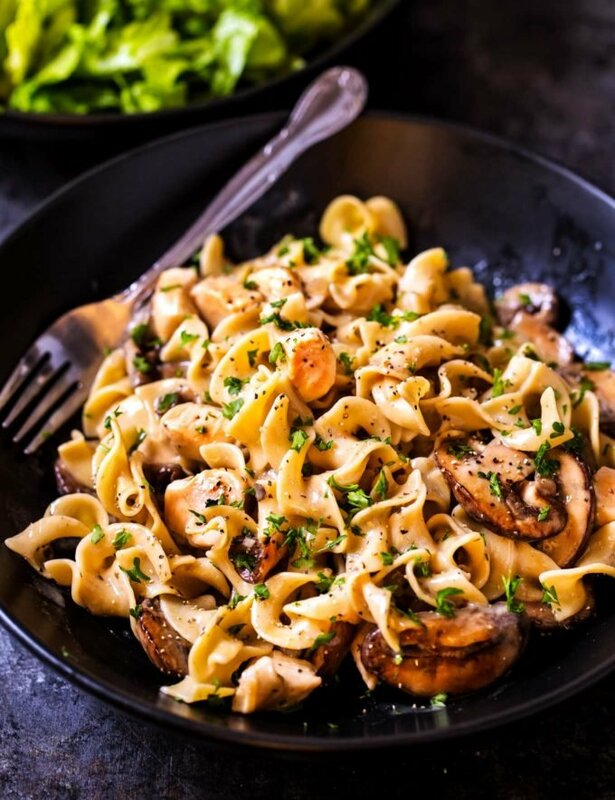 These mushrooms are deeper in flavor than the regular white mushrooms, and they really add amazing flavor. Play around with the amount of sour cream, as per your tastes. The sour cream make it tangy, so I recommend starting with about 3-4 Tbsp, tasting your sauce, and adding more from there if you want to. Don’t be intimidated by the amount of seasoning. We really want the seasonings to come through the rich sauce. It won’t be overpowering, I promise! The garnish is optional, but I highly recommend it! 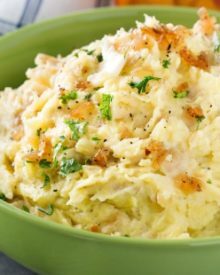 A sprinkle of fresh chopped parsley and a bit of cracked black pepper really takes this dish from great to ahhhh-mazing!!! Dutch Oven – perfect for cooking this recipe, along with boiling pasta, frying, making soups, etc. Deep Skillet – great go-to pan that comes with a lid! In a small bowl, add all purpose flour and 1 Tbsp chicken stock and whisk to combine. Set aside. To a large dutch oven or deep bottomed skillet, add 1 1/2 Tbsp of olive oil and heat over MED-HIGH. Add chicken pieces to pan, add 1/4 tsp EACH kosher salt and black pepper. Cook 5 minutes, until golden brown and cooked through. Remove to a plate. Add remaining 1 1/2 Tbsp of oil to the pan and add sliced mushrooms and onion. Add remaining 1/2 tsp black pepper, paprika, dried thyme, oregano, and red pepper flakes. Cook mushrooms about 6-7 minutes, until cooked and slightly golden. Add garlic and cook 30 seconds, stirring often so it doesn't burn. Pour in wine, scraping the bottom of the pan with a wooden spoon to loosen any browned bits of flavor. Cook wine about 2 minutes, or until reduced by about half. Stir in remaining chicken stock and bring to a simmer. Once simmering, add remaining 3/4 tsp salt and egg noodles, stir and cook, uncovered, 8 minutes or until cooked. Stir every so often as the noodles are cooking to prevent sticking. Pour in chicken stock/flour mixture, stir and cook 1 minute. Turn off the heat. Add in cooked chicken, sour cream and mustard. If desired, beef stock can be substituted for the chicken stock. 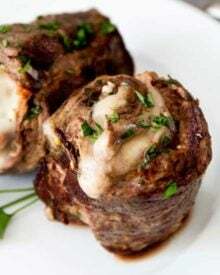 This recipe was so easy to follow and the meal turned out deliciously! I’ll be making this again in a few weeks. This is such a great meal for weeknights!! 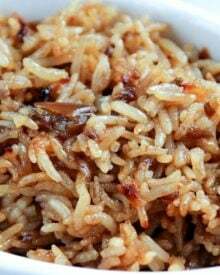 I tried this recipe this afternoon and it was easy and delicious. I can’t wait to catch up with all your ‘Recipe’!! 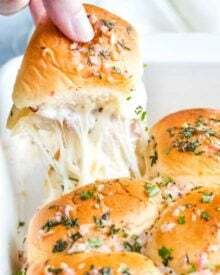 This is a great no fail recipe! Both my husband and I devour it!! Wish I could post a picture…. Quick to make and easy to clean up! I am in! Perfect weeknight dinner! Doesn’t get better than a one pot meal in 30 minutes! My mom use to make this for us all the time growing up. I can’t wait to make this for my kids! Thanks for reminding me how much I love this recipe! This is pure comfort food! Looks fantastic! I love that you used chicken for this instead of beef. Such a fun twist that I can’t wait to try! So so good! I added a couple shots of Worcestershire sauce…just cuz and it was great! Will make this again. Thank you! Tasty! I didn’t use all the salt and it was still quite salty so I probably wouldn’t use quite so much. I had no sour cream so added a tablespoon of lemon juice to 2 heap tablespoons double cream and stirred (it worked fine). I used a large saucepan rather than a dutch over and I can tell thus would have been more fkavourful with a dutch oven. If anyone is making it with a saucepan I would advise that you use skin-on boneless chicken thighs, or skin on breasts, so that you can brown the skin til crisp and get a good chicken-y flavour. Lovely recipe though and very nice seasoning! Any suggestions for doubling the recipe? I want to make for a new mom and to be effiecent, my family too. I made this last night dinner. I didn’t have Dijon mustard so I used regular and just half of the amount called for since i was unsure of using it as a substitute. I also couldn’t find fresh mushrooms at my local small town store so I used canned BUT followed the other directions as written and it was very good! My hubby and one year old gobbled it up. Thank you for sharing and we’ll be making this again! Hi, just wanted to say thank you for this recipe. I made it for the first time today and it was just great !! I’m a fan of any meal that can be made in one pot or pan and this is a keeper. So delicious and so easy ! The only thing I did differently: 1 tbs. Of cornstarch dissolved in a couple tbs. Ice Cold water as a thickener instead of flour and water. 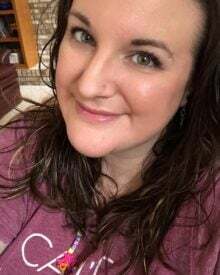 Hi Debra 🙂 I’m SO glad that you loved this recipe as much as we do! I need more one pot meals in my life! This looks delicious. This is looking super delicious!!! This looks so yummy, and you can’t beat one pan! Can’t wait to try! Holy smokes…this looks the bomb. The perfect dinner recipe! hey Amanda…….! 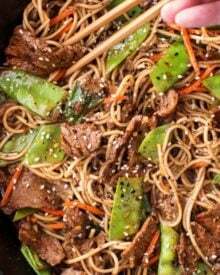 your dish looks so yummy and colorful, i will make it in this weekend….thanks for sharing and keep shared your new ideas and recipe……! Sroganoff is my favorite! I need to try your recipe, too! I am totally drooling over this!! OMG yum. Mm I love beef stroganoff! 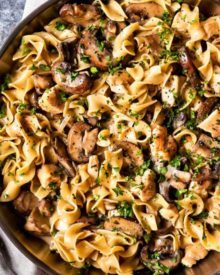 I have been looking for a yummy stroganoff recipe that’s a winner for so long. Can’t wait to try it.